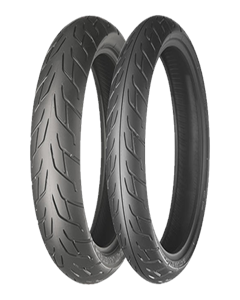 Loaded with mono-spiral belt and DTC technologies, BATTLAX BT-92 is an all round radial tire for mid-size motorcycles with wet performance, riding comfort, and controllability. BATTLAX BT-92 compound is balanced to give good dry grip, high speed stability, wear life, and wet performance. DTC technology in rear tire provides both tire life and cornering grip. The high-angled groove in the center tread gives wet performance in straightway and high speed cruising, and the low-angled groove for wet performance in low-mid speed range. The center straight groove in front tire is for straightway stability. The large, single crown radius for stability and linear cornering performance. BATTLAX BT-92 uses nylon mono-spiral belt for riding comfort and stability.